Procedure to be followed in applying for environmental authorisation for large scale electricity transmission and distribution development activities identified in terms of section 24(2)(a) of the National Environmental Management Act, 1998 when occurring in geographical areas of strategic importance. On 16 February 2018, Minister Edna Molewa published GNR 41445, Notice 113, pages 88 - 91 for implementation, providing in terms of section 24(5)(a) and (b) of the National Environmental Management Act, 1998 and Regulation 15 of the Environmental Impact Assessment Regulations, 2014 (Government Notice No. R. 982, in the Gazette No. 38282 of 4 December 2014), for the procedure to be followed in applying for environmental authorisation for large scale electricity transmission and distribution development activities identified in terms of section 24(2)(a) of the National Environmental Management Act, 1998. The following data is available for download from the Downloads Tab. 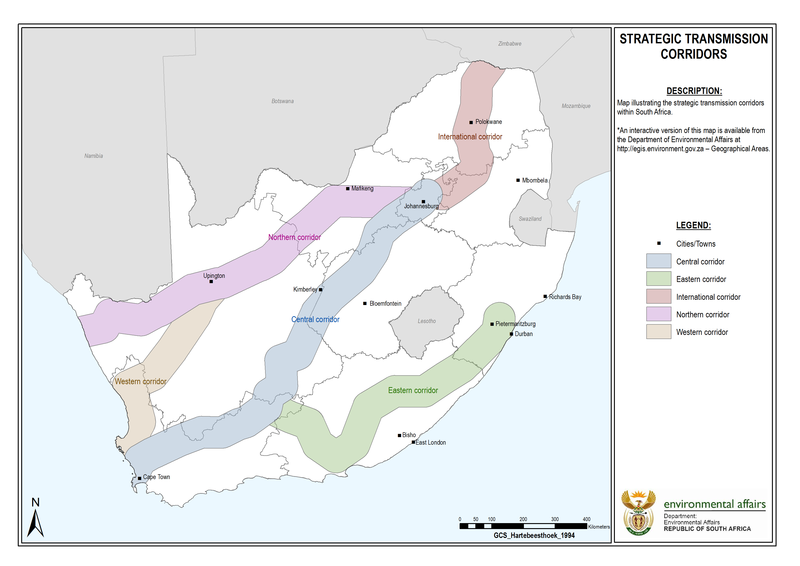 Transmission Corridors Dataset contains spatial data for the Strategic Transmission Corridors assosiated with the REDZs. Note: Registration / sign in is required to download the data.